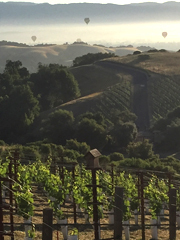 Robert Parker characterizes the 2013 Vintage as “the finest vintage I have experienced in tasting North Coast varietals over the last 37 years. It’s a game-changer in terms of the consistency of quality, the depth of quality, and the across-the-board excellence for so many wines.” —Robert M. Parker, Jr., The Wine Advocate, #221, October 2015. Our 2013 from Melanson Vineyard is noteworthy as it is the release blend from this remarkable vineyard that formed the barrel sample of last year’s Premiere Napa Valley “The Possible II” lot. This was one of the top five selling Auction lots offered at last year’s record-breaking Premiere Napa Valley. 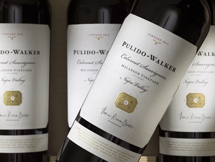 Of the 225 wineries in the Auction, Pulido~Walker joined a handful that broke through the $1,300 per bottle barrier. We look forward to releasing our extraordinary 2013 single vineyard designate wine from Melanson Vineyard in August. Shipments will begin in October, weather permitting. Available packaged as three 750ml bottles in a custom birch wood box for $585. On Friday evening of ANV, Pulido~Walker hosted its inaugural Vintner dinner at our Mt. Veeder estate. 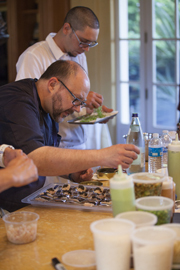 Twenty-two guests were treated to an intimate five-course meal prepared by Chef Sean O’Toole of TORC Restaurant featuring such delicacies as lobster with osetra caviar, fresh Perigord truffles, 60-day dry-aged beef rib, and a spectacular explosion of mignardises after dessert. The evening began with 2014 Rivers-Marie B. Thieriot Chardonnay followed by Pulido~Walker single vineyard designate Cabernet Sauvignon paired with the innovative menu including an acclaimed vertical of 2011, 2012, and 2013 Pulido~Walker from Melanson Vineyard located on iconic Pritchard Hill. Winemaker Thomas Rivers Brown eloquently and expertly described the luscious wines to our guests. The backdrop for the dinner was a spectacular view of the sparkling lights of Napa and our estate vineyard. The Napa Valley Vintners (NVV) announced that Auction Napa Valley 2016 raised $14.3 million for children’s education and community health nonprofits during a weekend of feverish bidding and Latin-infused fun at the annual celebration of the best of America’s leading wine region. To date, the NVV has given more than $150 million in Auction proceeds to Napa County nonprofits serving more than 100,000 clients annually. 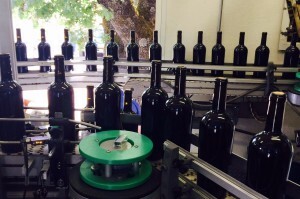 In early June, we bottled the Pulido~Walker single vineyard designate wines at Mending Wall Winery using state-of-the-art mobile bottling lines and a very attentive team. Our 2014 Panek Vineyard will be in bottle until its release in February 2017, with the 2014 Melanson Vineyard resting in the cellar for an additional eight months prior to shipping in October 2017. What is Happening in our Mt. Veeder Estate Vineyard? In mid-June, we began the process of removing all milk cartons that serve as a protective cover. 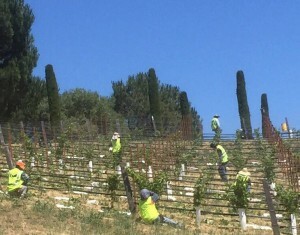 The vines are now being tied and trained up the vine stake to form the permanent “architecture/form” of the vines. We are training the vineyard to “Double Guyot,” which is a French style cane pruning technique. By the end of the season we will have the permanent trunks formed and have 3-5 shoots trained up into the trellis, which will serve as next year’s fruiting canes. In 2017, we will have our first crop in all blocks with the exception of one of the Chardonnay blocks, which will be field grafted this fall or next spring. The vineyard is growing very healthily at this time, and should look quite different in about 6-8 weeks as the vines start to fill the trellis with foliage. What Technology is Being Used in the Vineyard? As far as technology in the vineyard, we currently use weather stations to look at all weather parameters such as air temperature, relative humidity, wind speed, wind direction, solar radiation, and precipitation. Identifying and tracking weather conditions in the vineyard allows us to make informed weather-related decisions. In addition, we use electronic soil moisture monitoring sensors for vine irrigation purposes. This results in the ability to irrigate based on demand to ensure we provide just the right amount of water to each vine to ensure healthy growth. The stations are also used to monitor diseases like Powdery Mildew, as the stations have disease models that will help us decrease the amount of preventative spraying. In other words, by using disease models, we are able to spray less frequently and only when justified. As the vines mature in the coming year, more technology will be implemented in the vineyard. At bloom time, we will use leaf tissue analysis to assess nutrient levels and make certain optimal levels are maintained. When the vines begin to produce fruit in 2017, we will begin using a pressure chamber to measure vine stress in an effort to maximize water stress and subsequent wine quality. In 2018, electronic sap flow sensors will be implemented inside the vascular tissue of the vines to measure osmotic pressure through vine sap flow. Through this technology we will carefully gauge how the vines respond to irrigation, when to initiate irrigation, and more. All of these irrigation-monitoring techniques are intended to maximize wine quality but are no substitute for the skilled “hands-on” work by Clark Vineyard Management. Pulido~Walker Estate Olive Oil was awarded a Gold Medal at the 2016 Los Angeles International Extra Virgin Olive Oil Competition for Packaging Design. The lively art featured on the label was created by our son Chas. In 2012 for this artwork, he won an international design competition-the Mobius Awards Student Best of Show. In addition, our olive oil was awarded a Silver Medal at the 2016 Napa Valley Olive Oil Competition and a second Silver Medal at the Yolo County Fair in the category of Extra Virgin/Other Robust Blends. Enjoy with a glass of Pulido~Walker from Melanson Vineyard! Leave the meat out at room temperature for 1 hour before cooking. Preheat the oven to 400 degrees F. Heat olive oil in a heavy bottomed sauté pan. Season the meat with salt and pepper, then roast on all sides. Add a garlic clove, 2 sprigs of thyme, and two ounces of butter. Place the pan in the oven and cook 7 minutes on each side. Remove from the oven and rest. Break the fibrous end off the asparagus. With a small knife remove the leaves from the stalks. Wash under cold water and cut into thirds. Heat some olive oil in a sauté pan with a garlic clove, roast the asparagus until tender, and season with salt and pepper. Pick, wash, and tear the mint leaves. Toss the mint and asparagus together when ready to plate. Preheat the oven to 400 degrees F. Slice the top and the bottom of the potato. Heat some olive oil and garlic clove in a sauté pan; roast the potato until golden brown. Add 2 ounces of butter and the thyme, season with salt and pepper, place in the oven. Cook for 8–10 minutes then flip and repeat the process. Place the olive paste in a bowl and adjust the consistency with olive oil and water. Adjust the seasoning with red wine vinegar, salt, and pepper. Place the potato and asparagus on the back of a plate. Slice the beef and layer in front of the vegetables. Drizzle the Taggiasca olive around the plate and serve.